Aurelio Scotto: Born in 1983 and native of the Giglio Island (Tuscany, Italy), Aurelio Scotto is graduated with full marks in Piano and Composition at the Conservatory “Nicola Sala” in Benevento and theConservatory “Luigi Cherubini in Florence, and post – graduated at the Maggio Musicale Fiorentino Theatre (as répétiteur) and at the Chigiana Academy in Siena, studying Compositions with Azio Corghi, Oscar Prize winner Luis Bacalov and receiving the Merit Diploma. His music (instrumental, opera, electronic and visual) is present at the “Lincoln Center” New York (USA), “Carnegie Hall” New York (USA), “Harvard University” Cambridge (USA), “Weber Hall” Duluth (USA), “Fine Arts Building” Chicago (USA), “La Crosse New Music Festival” (USA), “Composerʼs Voice Concert Series” New York (USA), “Sherman Van Solkema Concert Hall” Allendale (USA), Hermitage Theatre in St. Petersburg (Russia), Locarno Theatre (Switzerland), “John E. Palmer Cultural Center” Lugano (Switzerland), “Arts Festival” Lugano (Switzerland), “Teatru Manoel” La Valletta (Malta), “Euromed Festival for Composers” (Malta), “City Halls” Glasgow (Scotland), “Centro Justica Federal” of Rio de Janeiro (Brazil), “Italian Institut of Culture” Tokyo (Giappone), “Festival della Valle dʼItria” Martina Franca (Italy), “Teatro dal Verme” Milan (Italy), “Teatro Giuseppe Verdi” in Pisa (Italy), “Teatro Lorenzo da Ponte” in Vittorio Veneto (Italy), “Louvre Palace” in Paris (France), Cité Internationale des Arts in Paris (France), Art Academy Cincinnati (USA), “Monumental Complex LʼAgostiniana” in Rome (Italy), “Teatro Nuovo” Udine (Italy), “Teatro San Giorgio” Udine (Italy), “Ada Art Gallery” in Barcelona (Spain) “Amart – Louise Gallery” in Bruxelles (Belgium), “Gallery Quirinus” in Köping – Stockholm (Sweden), “Fas/Pr/2013 – Feria de Arte Sonora” de Puerto Rico. He was awarded in many national and international composition competition, chaired among others by Azio Corghi, Fabio Vacchi, Daniele Zanettovich: in particular he won the “Città della Disfida Prize”, “Nino Rota Prize”, “Old Themes – News Operas Prize“ (promoted by Arena di Verona Foundation). Among others prizes: “Sound of Tales Prize”, “Antonio Manoni Prize”, “Antonio Smareglia Prize”. His graphic works get the “Tokyo Prize” and the “Oscar Award for Visual Arts” (Montecarlo Monaco). Among the interpreters of his musical works are: Royal Theatre of Parma Orchestra (Italy), International Orchestra of Italy, Malta National Orchestra, New York Miniaturist Ensemble (USA), Bateira Trio New York (USA), Fauré String Trio Pittsburgh (USA), Perpetuum Mobile Chamber Orchestra Lugano (Switzerland), Italian Opera School Bologna (Italy), Red Note Ensemble Glasgow (Scotland), Stephen Porter (Artist – Resident of the “Cité Internationale des Arts” in Paris, France), Alda Caiello, Marco Boni (Onorary Conductor of the “Concertgebouw Chamber Orchestra” Amsterdam, Netherlands), Alessandro Calcagnile (Artistic Director of the “Festival Cinque Giornate” Milan, Italy) and the Guadagnini Quartett, who played the first performance of “Praeludium” and “Passacaglia”. 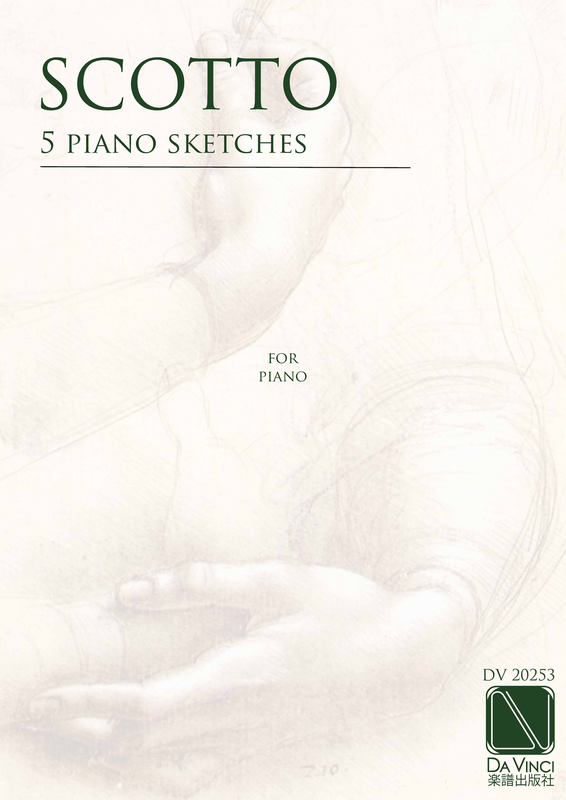 His compositions are published by Wicky Music Editions, Taukay Music Editions, Master Symphony Music Editions, IMG Music Editions, Ars Publica Music Editions, Valle Giovanni Music Editions (Italy and South America), Contemporary Music Center Milan (CD – Piano Haiku), Sconfinarte Music Editions, Première Music Edition (Switzerland), M.A.P. Editions Milan (Italy), Universal Music Publishing Ricordi Editions. As répétiteur, he worked to the opening of the “Astana Opera” (Kazakhstan) with the opera “Attila” by Giuseppe Verdi, conducted by Valery Gergiev and staged by Pier Luigi Pizzi. He worked also with “Teatro Giuseppe Verdi” Pisa (italy), “Teatro Goldoni” Livorno (Italy), “Teatro del Giglio” Lucca (Italy), “Teatro Marrucino” Chieti (Italy), Maggio Musicale Fiorentino Theatre (Italy), Maggio Fiorentino Academy (Italy), Fondazione “Pergolesi – Spontini” Jesi (Italy), ”Italian Opera School” Bologna (Italy), “Teatro Solis” Montevideo (Uruguay) and Opéra Montecarlo – Monaco. Among the artist with whom he has collaborated are: Jonathan Webb, Paolo Arrivabeni, Ralf Weikert, Fabrizio Maria Carminati, Carlos Vieu, Marco Boemi, Stefano Vizioli, Francisco Negrin, Jean – Louis Grinda, Rolando Panerai, Vivien Hewitt, André Heller – Lopes, Beppe Menegatti, Carla Fracci, Bruno de Simone, Giacomo Prestia, Dario Solari, Kolja Blacher, Wolfram Christ.